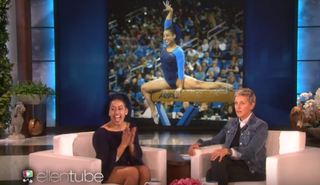 UCLA gymnast Sophina DeJesus, 21, appeared on The Ellen DeGeneres Show Wednesday to discuss her Feb. 6 floor routine that went viral. DeJesus incorporated the Nae Nae and dab into her routine, which catapulted UCLA over the University of Utah to win the competition. So far, DeJesus' video has been viewed over 40 million times. During DeJesus' appearance, DeGeneres played a clip of her first time on the show, when DeJesus was just 10 years old. DeJesus says she's too old for Olympic competition but that she's enjoying her last year at UCLA and wanted to go out with a "bang."